Helloo! Today I'm back with another Born Pretty Store review. This time I have their 'Starlight' nail vinyls to show you, which I used to create the mani below. 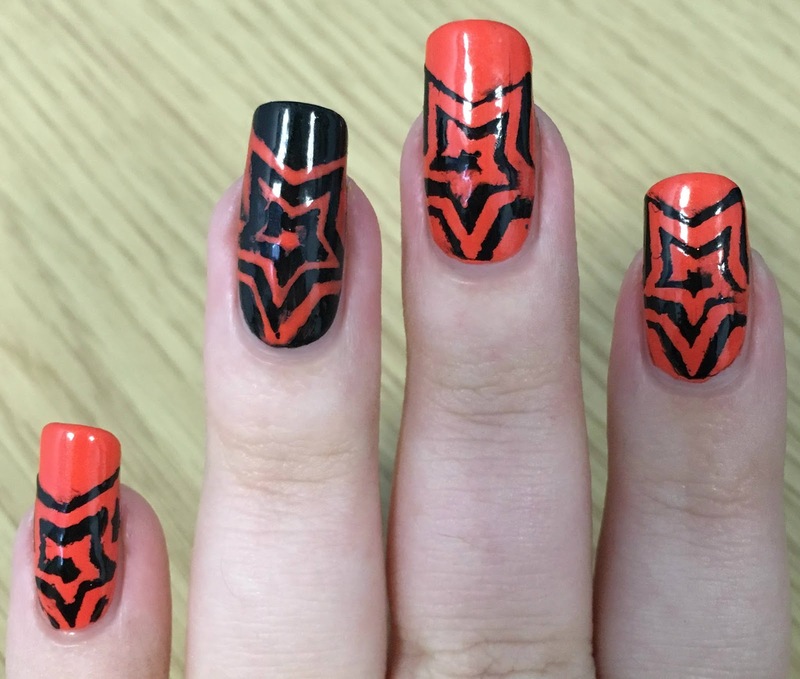 I chose black and orange polishes as a sort of transition into Halloween nails. Initially I did have a little bit of trouble using the vinyls, but soon sorted it out. Read on for more info! First, here's a look at the Starlight vinyls (item #27412, online here). They come as a sheet of 9, but you can use both the inside and outside of the pattern, so you technically get 18. 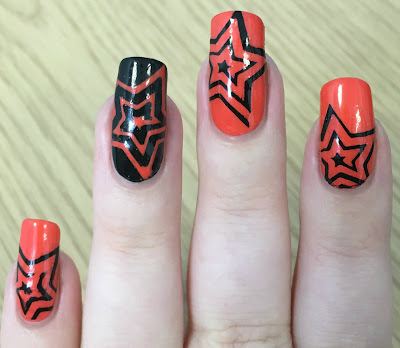 There are also some partial stars for smaller nails. I started by painting my ring finger with Pretty Serious 'Absence' (one coat - swatched here), and the rest with Crabtree & Evelyn 'Clementine' (3 coats - swatched here). Both are shown below with topcoat. On my first attempt, I used the vinyls directly on my nails. I've never used the cyclone type vinyls before, so managed to get them all tangled trying to stick them down. By the time I'd fiddled and got them on, they'd lost a fair bit of stickiness and bled. I decided to try again using my mini Uberchic mat. I placed the vinyls directly on the mat, polished over the top, and then peeled them off straight away. After 5 minutes I generously topcoated over them, before leaving them for 20 minutes to dry. I carefully peeled the decals off of my mat with a pair of tweezers. I placed them on my nails and removed the excess from the edges - using a pair of tweezers for the larger bits, and polish remover to neaten the edges. I finished by topcoating to seal them to the nail. What do you think? I'm really happy with how they turned out in the end. This was actually the first time I've used my mini uber mat, and only the second time I've made decals. With that in mind, I think it went really well! It was much easier using uber mat, and I might well do it for all vinyls in the future. You can find Born Pretty Store's online store here, and Instagram page here. I definitely recommend checking them out if you haven't already. These are so pretty, I love the orange and black combo and those star vinyls look amazing. I get scared by the more complicated designs but you make it look so easy. 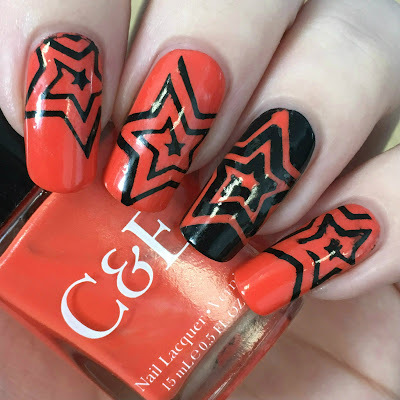 There two colours looks great together and your stars are making a really good statement - love it and i adore your long nails...what your secret to such long nails! These look awesome! Great color combo! black and orange goes together perfectly. I like vinyls but it takes too much time in cleanup and drying time but final results are worth. You used these perfectly! I always have horrible luck when I try to peel the vinyl off after using the polish. It always messes up.